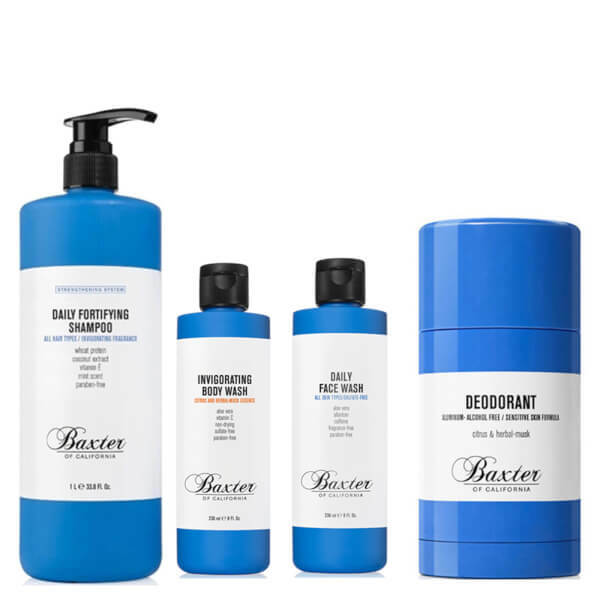 Spruce up from head to toe with The Complete Bundle from Baxter of California; a four-piece set that combines all the male grooming essentials needed to cleanse, refresh, hydrate and rejuvenate the hair, body and complexion for the day ahead, a night out, or after a sweaty workout session. A lightweight, nutrient-rich formula developed specifically for men. Powered by Coconut Extract, Wheat Protein and antioxidant Vitamin E, the revitalising shampoo effectively eliminates dirt and product build-up, whilst moisturising the scalp and promoting healthy hair growth. A dose of Mint delivers a pleasant tingling sensation for an invigorating and aromatic cleansing experience. A sulphate-free formula dedicated to revitalising and energising men's skin. Powered by Allantoin, Aloe Vera and Coconut-derived cleansing agents, the invigorating face wash effectively eliminates dirt and oil, without stripping moisture or uncomfortable tightness. Softens and cleans facial hair, whilst leaving skin feeling fresh and smooth. A mild, plant-derived formula that imparts a subtle, masculine scent. Infused with a cocktail of beneficial ingredients, including nourishing Jojoba Oil and antioxidant Vitamin E, the refreshing shower gel creates a rich lather upon contact with water to gently eliminate daily dirt and impurities. Skin feels smooth and hydrated with a herbaceous, musky fragrance. A scented deodorant stick with a gentle formula that prevents irritation and delivers protection against sweat and odour. Free from alcohol and aluminium, which are often causes of aggravated skin surrounding the delicate skin of your armpits, the stick contains an expert blend of herbs and citrus extracts to give gentle care. Suitable for all skin types, it's particularly beneficial to those with sensitive skin. Body Wash: Apply to wet skin, lather, then rinse. Deodorant: Apply directly to underarms. Use daily. Shampoo: Aqua / Water, Sodium Laureth Sulfate, Citric Acid Cocamidopropyl Betaine, Glycerin, Sodium Hydroxide, Sodium Chloride, Hexylene Glycol, Parfum / Fragrance, Sodium Benzoate, Salicylic Acid, Polyquaternium-10, Hydroxypropyltrimonium Hydrolyzed Wheat Protein, Limonene, Tocopherol, Sodium Acetate, Cocos Nucifera Fruit Extract / Coconut Fruit Extract, Phenoxyethanol, Isopropyl Alcohol, Xanthan Gum, Ci 42090 / Blue 1, Ci 19140 / Yellow 5, Potassium Sorbate. Body Wash: Aqua / Water / Eau Disodium Laureth Sulfosuccinate Glycerin Cocamidopropyl Betaine Sodium Cocoamphoacetate Ppg-5-Ceteth-20 Sodium Lauryl Sulfoacetate Decyl Glucoside Sodium Chloride Parfum / Fragrance Sucrose Cocoate Peg-150 Pentaerythrityl Tetrastearate Caprylyl Glycol Peg-6 Caprylic/Capric Glycerides Salicylic Acid Benzoic Acid Linalool Aloe Barbadensis Leaf Juice Powder Caffeine Ascorbyl Glucoside Limonene Trisodium Ethylenediamine Disuccinate Citronellol Geraniol Benzyl Alcohol Ci 14700 / Red 4 Ci 15985 / Yellow 6 Ci 19140 / Yellow 5 Sodium Hydroxide Citric Acid.